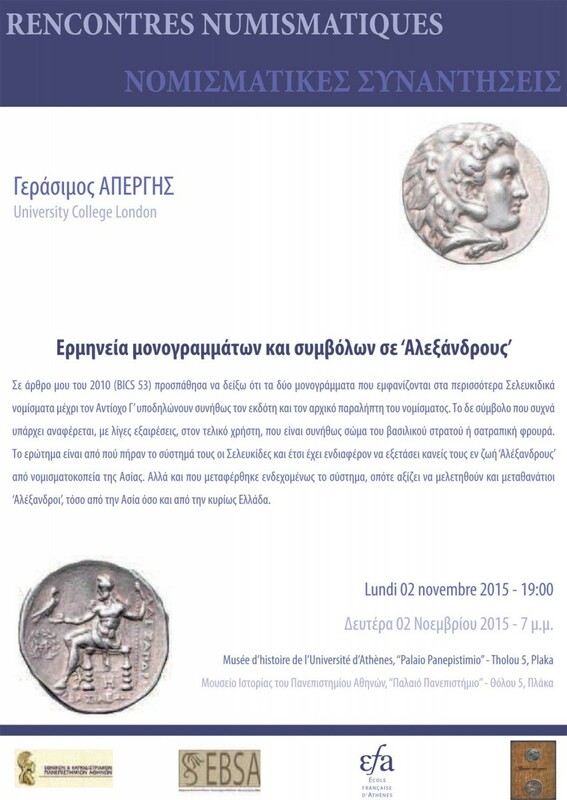 Makis Aperghis, UCL, will give a lecture on the “Interpretation of monograms and symbols on ‘Alexanders’. This will be the first Numismatic Seminar for 2015-2016. In a recent article (BICS 53, 2010), Aperghis tried to show that the two monograms that appear on most Seleukid coins to Antiochos III usually represent the issuer and the initial recipient of the coin. The symbol that is often present refers to, with few exceptions, the end-user, who is usually a branch of the royal army or a satrapal garrison. The question is where the Seleukids obtained their system from and so it is interesting to examine lifetime ‘Alexanders’ from Asian mints. But also where the system may have been transferred, and so it is worth studying posthumous ‘Alexanders’ too, both from Asia and mainland Greece. The Numismatic Seminar is co-organized by the Belgian School at Athens, the National and Kapodistrian University of Athens, and the French School at Athens.